Last year during Diwali, I tried this easy kalakand recipe using paneer and condensed milk ( Milk Maid) by watching YouTube video. Kalakand recipe is nothing but a rich milk cake. 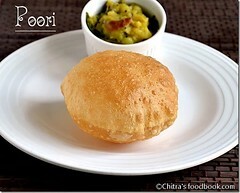 It is one of the popular desserts in West Bengal, Rajasthan, Delhi and some places in North India. 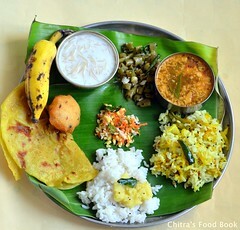 Traditionally it is prepared by boiling and thickening milk with sugar. It takes hours to prepare. This easy and instant kalakand recipe calls for just 3 ingredients namely Paneer/Chenna, Condensed milk and cardamom powder. 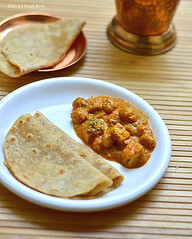 For variations, it can be prepared with ricotta cheese instead of paneer and rose water or kewra essence can be added instead of cardamom powder. It can be prepared so easily and quickly. 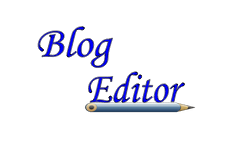 Its ideal for beginners. 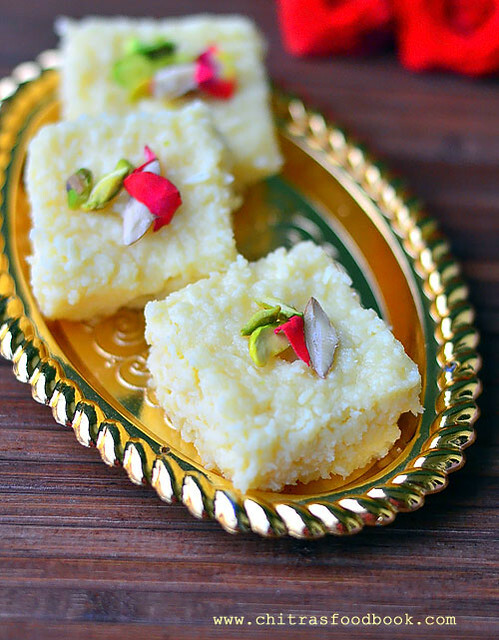 In North India, I heard people make Kalakand for Janmashtami as it is a milk based sweet. 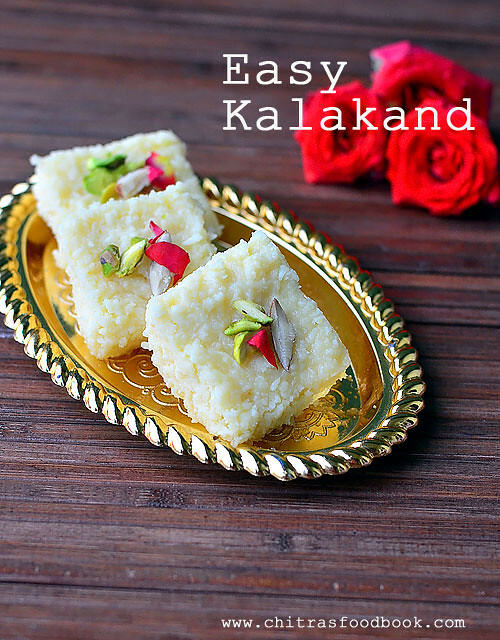 So I thought of sharing this easy and instant kalakand recipe for this Gokulashtami. 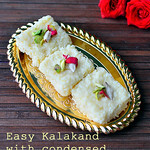 Do try this easy, Instant Kalakand recipe using condensed milk and store bought paneer. Lets see how to make it with step by step photos. 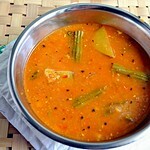 In a kadai, heat 1 tsp ghee and add the condensed milk. Mix well. Add grated paneer, cardamom powder and mix well. When the mixture thickens and leaves the sides of pan, switch off flame. Transfer to a greased or butter paper lined bowl. 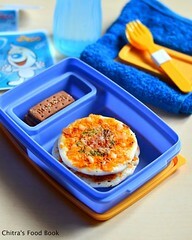 Refrigerate for an hour. Cut into pieces. Garnish with chopped nuts. Serve ! Take the store bought paneer and grate it. Measure 1 cup from it ( loosely packed) and keep aside.Line a pan with butter paper or grease it well with ghee and set aside. 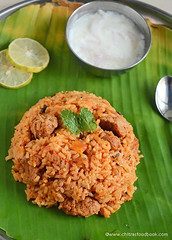 Heat ghee in a non-stick kadai and add the condensed milk. Mix well in very low flame. 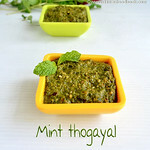 Add grated paneer, cardamom powder or rose water and mix well. 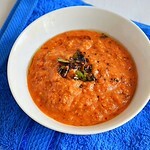 Paneer absorbs condensed milk and it will thicken initially. But if you keep mixing in low flame, mixture will become loose and watery. Keep the flame medium and stir well. After 3 to 4 minutes, it will start to thicken and leave the sides of pan. Mix for a minute. You will see the mixture becoming grainy and thick. Switch off the flame and remove the pan immediately. Pour it to the butter paper lined pan for 2 inch thickness. Level it and refrigerate it for 1 to 2 hours till its well set. Garnish with chopped nuts and stud it well. Cut into pieces and serve chilled for best taste. You can add some sugar ( say 1tbsp) if you feel sweet is less. Fresh chena tastes the best. 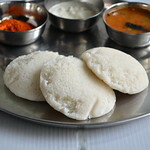 But I used store bought paneer. If you mix for long time, kalakand may become chewy.So remove at the right time. If you are not able to cut into pieces, refrigerate for more time. 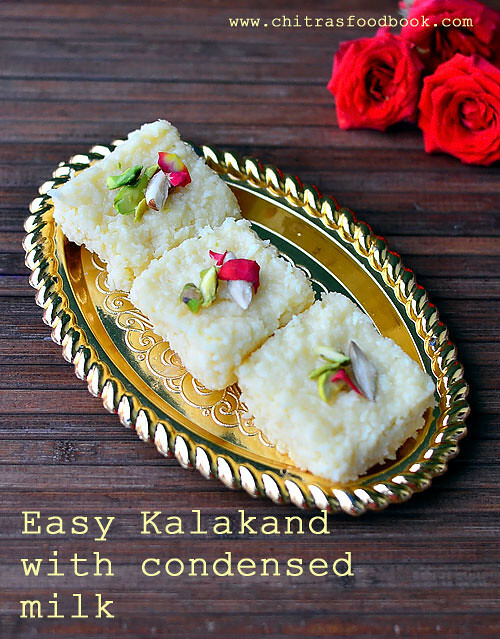 Easy, yummy, Instant kalakand is ready to serve !